Construction began in May 2018 and is scheduled to be complete by February 2019. A new standby generator is being installed at 43rd Avenue and S. El Camino Real. 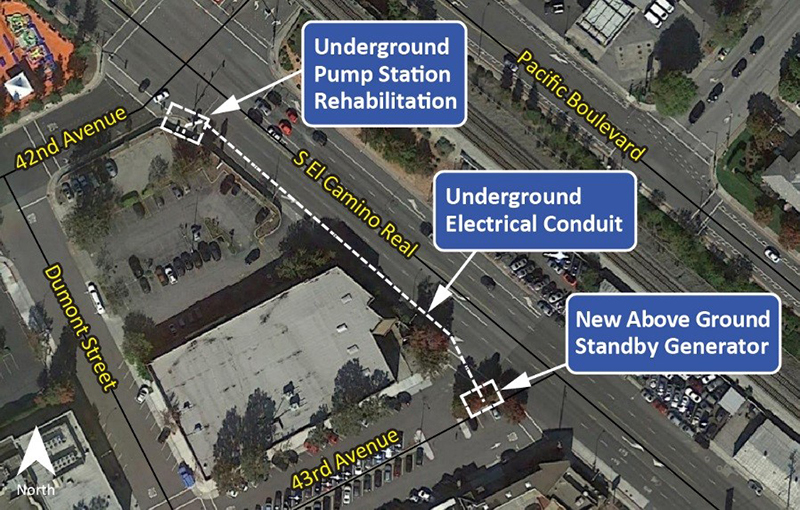 New electrical conduit will be installed on S. El Camino Real between 42nd and 43rd Avenues. The City of San Mateo is rehabilitating the 42nd Avenue Pump Station as part of the Clean Water Program and as a compliment to the City’s biennial pump station rehabilitation program. The project is not intended to increase the capacity of the system, but rather to ensure the existing collection system components continue to function optimally. The project consists of three elements: 1) the rehabilitation of an underground pump station, 2) the replacement of underground electrical conduit, and 3) the installation of a new, above-ground standby generator. This project required the demolition and removal of existing electrical equipment, pumps, valves, piping and access hatches. Pump stations are a necessary component of the wastewater collection infrastructure. These pumps support the upward movement of wastewater from underground gravity pipelines. When the wastewater levels rise, the pump starts and lifts the wastewater upward through a pressurized pipe system and ultimately to the wastewater treatment plant. Over time, underground pump stations corrode and break down. Rehabilitation helps to extend their useful life. Failure of the pump station to move the wastewater can lead to sewer overflows. The rehabilitate work includes repairing pipes and valves, as well as recoating the existing wet well and underground vaults. The project also includes replacing electrical and instrumentation controls, constructing remote motor control center and transfer switch, and installing new valve access hatches. All wiring to the pump station must be run in a conduit and routed below-grade, inside walls, or within slabs to the extent possible. The existing conduit is in need of replacement due to age and deterioration. The electrical conduit will be installed in El Camino Real from 42nd Avenue to 43rd Avenue for the new backup generator across 43rd Avenue, which includes excavation of existing material, installation of conduit, backfilling and final paving. Electrical conduit will also be installed along El Camino Real from the pump station and across 43rd Avenue to the new above-ground generator across 43rd Avenue. The purpose of a standby generator is to automatically come online in the event of an outage to keep the pumps running and wastewater flowing through the collection system. The existing standby generator has reached the end of its expected useful life and can no longer be maintained with available parts. In lieu of repair and upgrades to existing unit, a full replacement was determined to be more cost-efficient, more reliable, and provide faster response time when utility power is out. A more compact, diesel-powered engine generator and fuel tank will be installed as part of this project. The work includes a new generator pad area, as well as a remote motor control center and transfer switch. The new system includes new switch gear, batteries, and battery chargers.